Thrush Stop (SBS Equine Products) is a thrush treatment that kills the fungus and bacteria that cause thrush quickly and safely. 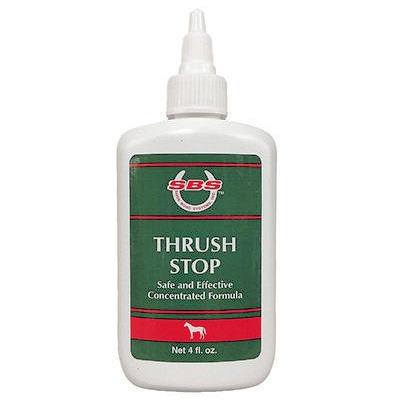 Thrush Stop creates an antiseptic barrier between thrush and healthy tissue by actually bonding to the hoof protein for long-lasting protection. Thrush Stop contains no formaldehyde (formalin) or other cancer causing agents; is not caustic like other commercial preparations that can mummify and stunt new horn growth. Thrush Stop can also be used before applying silicone and sole pads to reduce the possibility of reinfection. And it is also effective against stubborn Candida (yeast) infections.